Brush the mushrooms with olive oil and season, then cook over hot barbecue coals or a griddle pan for 8-10mins turning once until browned on both sides and tender when tested with a fork. Transfer to a plate, gill side down and leave for 5mins. Toast the ciabatta rolls on the hot barbecue coals or under the grill. 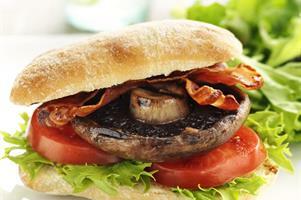 Fill the rolls with lettuce, tomato and top with the mushrooms and bacon. Finish off with a dollop of BBQ sauce, ketchup or mustard to suit your taste.